Prior to my decline in health due to the development of autoimmune hypothyroidism (an underactive thyroid), I was top of my class or among the top in every school class, year on year. I did well at school and college and I had a thirst for learning whatever I could. I enjoyed learning. Going into my first few jobs, this carried through. I began a business apprenticeship and I jumped out of bed in the morning with motivation and drive to have another day filled with learning new things and developing my skill set. I was on the ball, motivated, bright eyed and switched on, often ahead of my peers or colleagues. I’m naturally a very organized person and enthusiastic about life. But when my health started to slip, and boy did it slip badly, I started to get a whole host of hypothyroid symptoms and these affected not only my home life, but my work life, too. These symptoms included fatigue, brain fog, depression and generally feeling slow in thoughts and speech. I began getting things mixed up and muddled, including what I was supposed to do and when, forgetting things and saying the wrong words. For instance, picking up the phone at work and saying “Good morning… Urm… Oh… How can I help?” as opposed to “Good Morning, office XYZ, Rachel speaking,” is an example of how thyroid brain fog has affected my professionalism and ability to work. And it was embarrassing. It should be an easy thing to do, to answer the phone with the correct greeting. As well as forgetting things, I also mix up words completely, for example, “What are we having for dinner?” coming out my mouth as “What are we doing for sellotape?” When I say these actually quite comical things, I usually wait for the response, unaware that what I wanted to say and what actually came out was pretty different, and as the person I’ve said it to looks confused, I realise I’ve done it again. I’ve “done a Rachel” of getting muddled. Answering a question is also often not easy for me to do. Somehow, questions really confuse me. It’s like my brain can’t process them at all! So when your boss starts asking about stats and things and your brain makes you reply “Huh?” it’s not impressive or helpful. I can read whole texts of information and have no clue what I’ve just read, my brain unable to process it, thanks to the brain fog. I often look at a word and can’t for the life of me make that connection in my brain that says “this word is “cat.’” I just stare at the word and don’t know what it is or means. I can’t read it and that is really crazy. I often feel like I’m going mad. Starting a letter or email can therefore take me ages, too. I’m just sitting, staring at a screen and figuring out what I’m supposed to be doing. Type anything, I say to myself. I can’t even muster up a few basic bullet points to get me started some days. I’ve also become slower in my speech. I often slur words altogether and people take a second to figure out what I meant to say. As if I’m drunk or something, at 9am on a Monday morning in the office. Forgetting certain words is also common, so I use a lot of “thingy” and “that thing,” getting frustrated when I can’t put together the pieces of a sentence. All of these cognitive effects from hypothyroidism have, I’m sure, led to some people thinking I’m just ditzy or unintelligent. Especially when I’m trying to have a serious conversation or in a meeting. And that’s upsetting when I was once so switched on, career ahead of me. This gets lost amongst the brain fog now. I’ve also lost some confidence in myself. The way it also affects my ability to take in new skills and knowledge and hold on to them is also concerning. 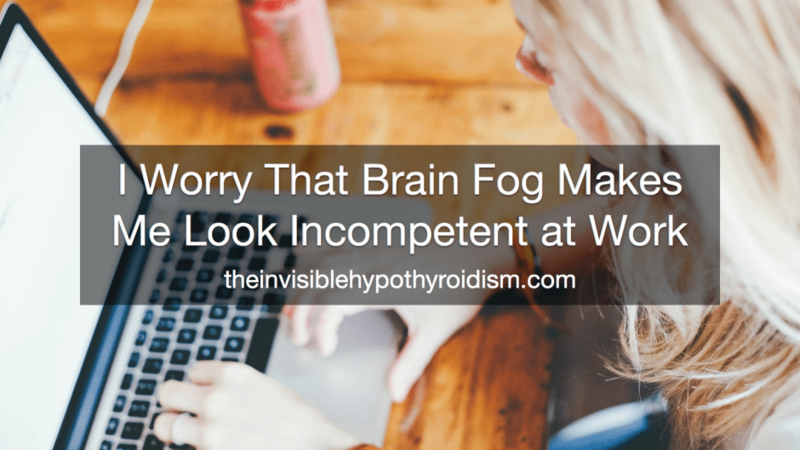 See, hypothyroidism can cause some brain degeneration and, as well as being forgetful or foggy-minded (struggling to think clearly and efficiently), it also makes learning new things extra difficult. Rachel two years ago was sucking up all the new knowledge and skills I was learning in my apprenticeship, but now I struggle to remember what I already know and have been doing at work for the past four years! I’m also pretty clumsy, which I’m sure is definitely linked to the hypothyroidism. Tripping over my own feet, dropping things and generally feeling wobbly on my feet can add to this idea that I’m ditsy and a bit of an airhead. It’s not very professional and actually rather embarrassing. But one of the worst symptoms to affect my work life is the severe lack of motivation and drive. Some days, I’ll come in to work with so much energy and positivity to get things done. I have lots to do and feel accomplished each time I tick one off, so that drives me. But this isn’t all too common. Most days, I have a severe lack of drive and motivation and I feel so, so low. I’m 23, at the beginning of my career and I can’t think of any work or job that would get me enthusiastic about working and just feel motivated every day. I see friends pushing for new, more senior jobs, promotions and going back to studying to develop their career. And I’m sitting here struggling to put together an email. Like I say, some days are fulfilling and enjoyable at work, but most days I’m doing it because I have to. And it’s not because of the line of work I’m in, because it’s right up my street on paper. It involved event organization, some admin and being very organized. I love that stuff and I always have. But an imbalance in hormones or chemicals in my body gives me very little motivation and drive most days, where I swing in and out of anxiety and depression, too. This does pass over into my personal life too and I often struggle to find the drive to keep up with housework, grocery shopping and social activities and events. It’s always a conscious effort, to actually do stuff. I’m nowhere near as energetic, motivated, “switched on” and efficient as I used to be at work. It’s true that a well-managed and treated thyroid condition shouldn’t really leave you with many symptoms, but truth is, managing it can be difficult as there are good and bad days, flare ups and bumps in the road. And I do worry that, when I spend another meeting with colleagues in silence, because my mind is processing everything at a much slower speed or my mind won’t focus despite me really trying, or I say something silly or slur my words, also dropping a file or two and forgetting to send that really important email, that it will affect my ability to progress in my job and reassure colleagues and managers that I am intelligent and can be efficient at my job. Please remember that if you’re a thyroid patient living with poor mental health or lingering physical symptoms (such as brain fog), that you don’t have to live this way. To address why you may still be feeling unwell (often despite being on thyroid medication too), please see this article and go through each suggestion, putting your thyroid jigsaw back together. Have the symptoms gotten any better since going on a thyroid medication? How are you doing now? Better once I changed from Levo to NDT but even better after going gluten free. This sounds like me to.I also have performance anxiety, social anxiety, and sleep apnea, and I think that caused my short term memory loss also in addition to this.